You can make these kebabs using straws instead of skewers if you like. 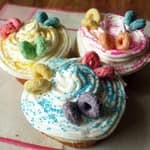 They are quick to put together and children love eating them. Here are some ideas to try, but feel free to make up your own combinations. For the Prosciutto and Melon kebab, cut 8 small wedges from the melon. Cut the prosciutto in half lengthwise and slightly fold in the long edges of each piece to make neat strips. 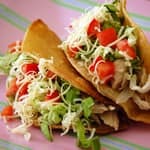 Wrap one strip of prosciutto around a wedge of melon and thread onto a straw or skewer. Repeat with the remaining prosciutto and melon. For the Tomato and Mozzarella kebab, season the mozzarella with salt and pepper to taste. Thread a cherry tomato onto a straw followed by a ball of mozzarella, followed by a basil leaf (if desired). Then repeat, threading another round of tomato, mozzarella and basil onto the skewer. Whisk together the ingredients for the balsamic dip and season to taste with salt and pepper. Drizzle this over the kebabs before eating. 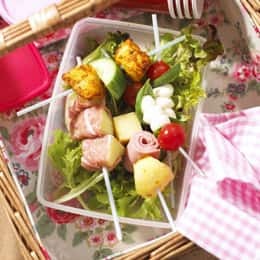 Other Salad Kebab Ideas: Chicken Tikka and cucumber; Slices of ham or turkey rolled up and interspersed with cubes of cheese and wedges of pineapple.